Everyday, throughout the day, we are each confronted with countless decisions. Which choices are correct, and which choices are incorrect? Is it possible to know? Which choices will lead to better outcomes for ourselves and those whom we love? Is there a way to choose wisely? The “Answers From God” series describes some of the insights that the author has obtained from God, and it details how to have a relationship with God (יהוה) and how to obtain one’s own answers from God to all of one’s “life” questions, big or small. 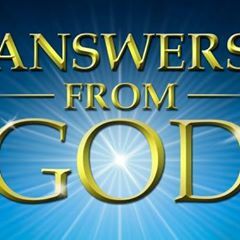 You can obtain some of your own answers from יהוה at AnswersFromGod.com. This page was created in 1.5086 seconds.